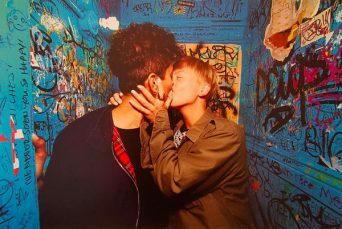 The Lexington Club was the iconic dyke/lesbian/queer bar that operated for 18 years in San Francisco’s Mission District, until the last drink was served on April 30th, 2015. “The Lex” was an internationally known beacon to lesbians, dykes, bois, queers, and their friends who came to the “Gay Mecca” of San Francisco. For many, it was more than a bar – it was a living room, a cultural center, a safe space. With its closure, the queer community is left to both remember and re-imagine new spaces in which they can come together and experience one another. This exhibit of images and ephemera, curated by Lauren Tabak and Susie Smith of the Lexington Club Archival Project (LCAP), aims to show the vibrancy of the community that formed around the Lex. Amidst changing patrons and aesthetics, the space transformed and was transformed by its community. The Bay Area is not the same without it. Lauren Tabak and Susie Smith shot over 150 images inside the bright blue-walled bathrooms during the finals months that the bar was open, documenting the faces and emotions of the patrons as they came to say goodbye to the beloved institution. Artists include: Ace Morgan, whose black and white documentary photos capture the opening night and the ten year anniversary party; Molly DeCoudreaux who, over the years, created many of the images used in promotional materials; Elizabeth Beier, whose raw and hilarious comics recall her adventures in the Lex; Lauren Tabak & Susannah Smith who photographed patrons in the iconic bathrooms during the final months; and Rebeka Rodriguez & Cody T. Williams, who both shot portraits outside the bar during the closing night parties. Posted September 9th, 2016 & filed under Entertainment.